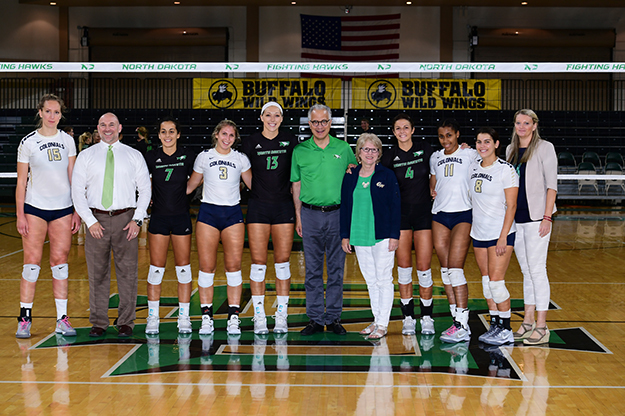 UND President Mark Kennedy and First Lady Debbie Kennedy (center) played the role of good hosts to members of their former school’s volleyball squad on Friday, Sept. 8. After the UND Fighting Hawks defeated the George Washington University Colonials 3-0, the First Couple took time for a photo with coaches and players from both teams. The Kennedy’s came to UND after a stint at GW in Washington, D.C. Photo by Russ Hons, UND Athletics. 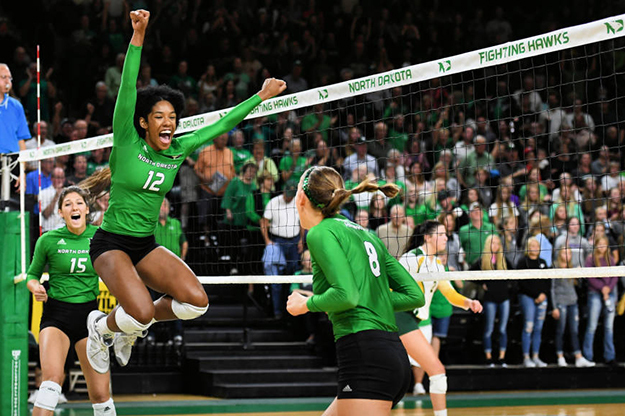 UND President Mark Kennedy and First Lady Debbie Kennedy had both sides of the aisle covered last week when their current University home, UND, played host to their former favorite university, George Washington University, in volleyball at the Betty Engelstad Sioux Center. The Kennedys quickly made their way from the UND Athletics Boosters Luncheon at the Alerus Center on Friday to catch the last two sets of the match between the Fighting Hawks and the Colonials. President Kennedy was a professor and director of the Graduate School of Political Management for four years at George Washington University in Washington, D.C., before being named UND’s 12th President in 2016. President Kennedy showed for the UND-GW game appropriately attired in UND school colors, including a bright kelly green Fighting Hawks polo shirt. Debbie Kennedy, however, brought a bit of balance to the situation, sporting a blue and buff George Washington University Colonials jacket as a conciliatory gesture between their current and former allegiances. After the match and a 3-0 sweep of GW by the UND Fighting Hawks, President Kennedy explained their dueling show of support. The Kennedys were able to show their appreciation to visiting GW even more by coordinating a photo opportunity with UND and GW coaches Mark Pryor and Sarah Bernson as well as player captains from both squads. The match was the Fighting Hawks’ first of three in their own UND Classic Tournament, smack dab in the middle of Potato Bowl Week at the University and in Grand Forks, and amid what is shaping up to be a magical season, so far, for UND Volleyball. Two nights earlier, UND Volleyball took care of its in-state rivals, North Dakota State (NDSU), 3-0 at The Betty before an announced attendance of 3,140 people – the largest attended volleyball match in North Dakota history. At one point between sets, North Dakota Head Volleyball Coach Mark Pryor quipped to a TV interviewer that The Betty could be considered one of the larger cities in North Dakota with that kind of attendance. Jordan Vail, a junior middle blocker from San Antonio, Texas, is new to the UND-NDSU rivalry but she’s catching on quickly. UND Fighting Hawks Junior Jordan Vail (12) had seven kills and four block assists in the sweep of NDSU in front a packed house at The Betty on Wednesday, Sept. 6. Photo by Russell Hons/UND Athletics. The victory over NDSU continued a huge chain of momentum for the Fighting Hawks extending back to Aug. 31 in Las Cruces, New Mexico, where UND beat home team New Mexico State 3-2. Since then, UND has rattled off nine straight wins to bring its overall record to 13-1 and garner a No. 13 ranking in the Volleyball Mag.com mid-major poll. UND Volleyball also currently owns the most wins in the nation. 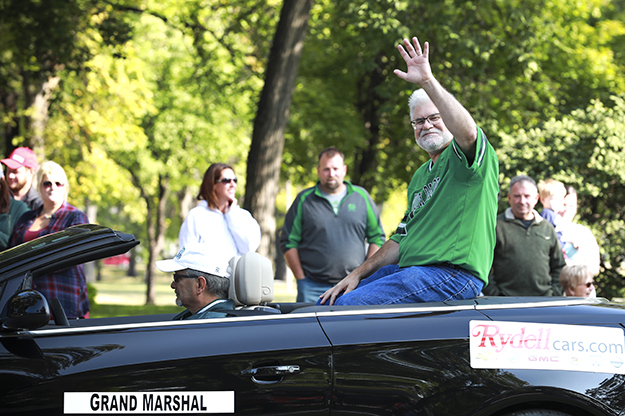 Longtime UND employee and current Interim Vice President of University & Public Affairs Peter Johnson leads the annual Potato Bowl USA parade down University Avenue on Saturday, Sept. 9. Johnson plans to retire from the University in December. Photo by Jackie Lorentz. The volleyball success of Potato Bowl Week also rubbed off on other UND Athletic programs, namely UND Football, which, on Saturday, avenged a 38-0 loss in 2014 by the Missouri State University Bears in Springfield, Mo., by whipping that same program into a submission with a 34-0 stomping in the 52nd Annual Potato Bowl at the Alerus Center. The game followed the annual French Fry Feeding Frenzy and fireworks on Thursday at University Park, where another world record was set with more than two tons of French fries consumed; and Saturday’s Potato Bowl USA Parade down University Avenue, led by this year’s grand marshal, UND’s-own Peter Johnson, interim vice president of university & public affairs. All the festivities and the lure of new tailgating features and a Top-11 UND Football team brought the fans out in droves on Saturday, as more than 12,000 people cheered the Fighting Hawks on to football victory, the biggest crowd at the Alerus Center in eight years. Reflecting back on the game, Fighting Hawks Head Football Coach Kyle “Bubba” Schweigert cracked a proud smile as he led off his weekly press conference with a nod to the home crowd.